I love it when young colleagues approach me and and ask for advice how to get ready for their first facilitation task. It is great they accept the challenge and are curious. Indeed, there is no better way to become a facilitator than practice. Facilitation needs practice. And confidence (see also my story on the SDC Learning & Networking blog). I advise them to start with purpose, people and process. And I tell them that facilitation is a matter of good preparation. Getting the 3 Ps clear is a good starting point for their facilitation task at hand. You have the most leverage on a meeting’s success before a single person walks into the room. What is the reason for this workshop? What is the intention of the organizers, those who call for the workshop? What do they want to achieve with the workshop? Why is this workshop important to them and why now? What are the interests and intentions of the people attending? Is the purpose clear and shared within and beyond the organizing team? What are the key questions the workshop helps to enquire? At the end of the workshop what will the participants carry with them, in their hands, in their mind and in their hearts? What are the tangible and intangible values the workshop helps to create? A shared purpose is a clear purpose. I can see that the purpose is clear when all involved parties tell the same story about the workshop. 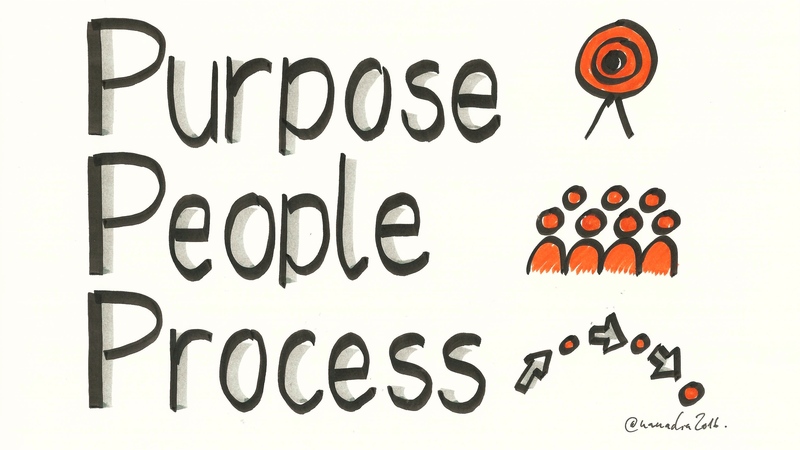 Crafting a purpose for your convening might sound like a check-the-box exercise. Yet it actu­ally serves the very functional role of providing you with a north star to guide you through the many practical choices that follow. Who are the people joining? Are these the right people? Who is missing? What is their expertise and experience on the topic at hand? What will they contribute? What perspectives will they bring and what questions do they hold? Do people know each other, how well are they already connected? Who are the newcomers? Connecting people is no luxury, people who feel connected share more a easily, also beyond the workshop and that’s what we aspire for, isn’t it? I think one of the great arts of facilitation is to keep things simple. What is the process, before, during and after the meeting? What roles do the members of the organizing (or calling) team have in the preparation and during the workshop? Is there someone who would be ready to co-facilitate the workshop with you? Is the design of the workshop ensuring a smooth process that allows for deep and meaningful collaboration and cooperation? Does the design of the program facilitate hearing all voices, also the voices of the shyer and more introverted people not taking the word easily? Is their adequate space for networking and reflection? My personal credo is: As much conversation as possible, as much input as necessary. The choice of supportive methods is important, but in the end it is more important to be present and flexible to serve the group. What advice do you give to young facilitation colleagues?